A Sarasota man was killed in a wrong-way collision after his vehicle collided head-on with a dump truck. According to the Tribune, the incident occurred when a driver was trying to pass another vehicle and crossed a divided yellow line, going in the opposite direction of oncoming traffic. Incidents in which drivers are passing on the opposing side of the road are a very common cause of head-on accidents. Many other head-on crashes also occur because drivers go the wrong way on highways when they actually enter onto an exit ramp. Because head-on crashes in Florida typically occur as a result of wrong-way drivers, motorists who want to stay safe from these crash types should learn the cause of wrong way collisions. U.S. Department of Transportation Federal Highway Administration reported on a survey of 110 wrong-way crashes. Of these accidents, 71 occurred on mainline freeways, 31 occurred on exit ramps, two occurred on entrance ramps, and six happened on a ramp connecting one freeway to another. Crashes on freeways are likely to occur if drivers become confused and get on the freeway going in the wrong direction. This confusion could happen because of poor road design. Cloverleaf design on and off ramps are the most dangerous design, and a higher number of head-on accidents occur in these areas. Cloverleaf designs involve on-ramps and off-ramps which are located adjacent and parallel, necessitating a left turning driver go past the wrong lane before turning onto the correct lane. Drivers may easily become confused and go into the wrong lane, especially in situations where "No Enter" or "Wrong Way" signs are not prominently displayed. In some cases, driver confusion and driver error are caused by decisions drivers make. National Transportation Safety Board revealed 60 percent of wrong way collisions involve driver whose blood alcohol concentration exceeds the legal limit. Among young drivers age 20 to 39, this number is even higher, with 65 percent of drivers who go the wrong way having alcohol in their system. These drunk motorists who go the wrong way almost always hit others head-on. Aging is a possible cause of confusion as well. Once a driver has reached the 70-79 age group, he's 2.5 times more likely than a motorist age 60 to 69 to go the wrong way and cause a collision. Among drivers age 80 and older, there is a 30 times greater risk of getting into a wrong-way accident. Typically, wrong way crashes with seniors don't involve alcohol, but instead natural declines during the aging process make seniors unable to drive as safely as they did in the past. With 76 percent of American over 60 reporting they take at least two prescription drugs monthly, prescription medication use could also be a factor in why so many senior wrong-way accidents happen. 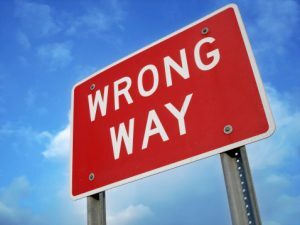 Prevention of wrong-way crashes needs to be a top goal, as Florida Traffic Crash Statistics report 153 fatal head-on collisions and 7,575 head-on collisions causing injury over the course of a single year in the state of Florida. Drivers can do their part to help reduce risks of head-on crashes by not getting drunk, following road signs, and stopping driving when they are too old.